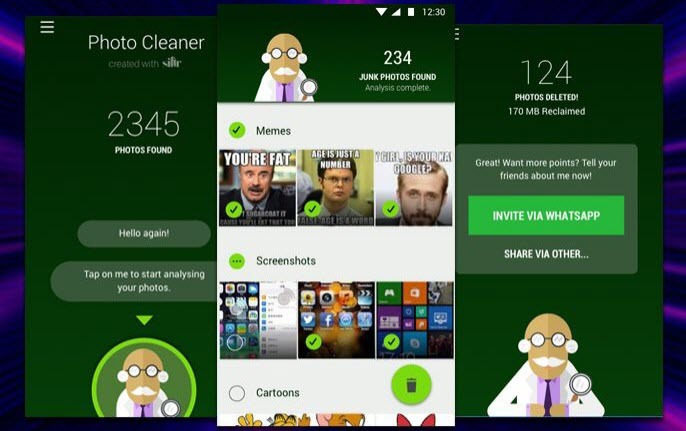 Have you ever heard about Magic Cleaner for WhatsApp? Are you curious about how it can do for you? Do you want to know where to download it? You can find the ansers below. What’s Magic Cleaner for WhatsApp? Have you ever noticed that WhatsApp likes to hang onto every picture that anyone ever sends you? It might not seem like a couple of little pictures take up much room on your iPhone, but over time all of those images can accumulate and take up precious storage space. Basically, what Magic Cleaner for WhatsApp does is that it identifies and helps you delete junk images in WhatsApp that you don’t really need. It finds these photos automatically for you, but you can always look them over before you confirm that Magic Cleaner can delete them all for you. It’s very convenient. It’s a convenient app that you can download straight onto your iPhone. It will automatically find junk images that you don’t need. It allows you to remove the images at your discretion. Basically, it’s a great tool to have if you want to save WhatsApp space on your iPhone. Magic Cleaner is easy to use and works fairly quickly. It’s also good at finding the photos that you don’t really need, such as the screenshots and memes that are just taking up space in your storage. The interface is easy enough to use, and you can even select junk photos individually to send them to the trash. It was all a very intuitive process that only takes a few taps to accomplish. Easy to use, simple interface. Automatically choose junk files for you. Can be used easily right on your iPhone; no need for a computer. The iOS version may be difficult to find, and doesn’t appear to be on the official iTunes store currently. It is not a security-oriented app, which means that the data you delete will not be permanently deleted. Your photos could still in theory be recovered by special recovery software. There are several reasons why Magic Cleaner for WhatsApp is not the best choice in cleaners out there, but the primary reason is privacy. If you are deleting photos from WhatsApp, it’s good practice to make sure that the data is scrambled and that your photos are permanently deleted beyond recovery. Magic Cleaner cannot provide this, which is why a different kind of application that puts more of an emphasis on security would be a better choice. This way, even if you lose your iPhone or give it away, no one will know what data you deleted from WhatsApp. One of the best WhatsApp cleaner/erasers on the market is iMyFone WhatsApp Eraser. It will delete any kind of WhatsApp data permanently so that no one can ever recover what you’ve deleted. It also completely wipes private messages, contacts, call logs, notes, browsing data, and many more from iPhone/iPad/iPod. 100% Unrecoverable - Data erased by iMyFone is no longer recoverable by any tool and organizations, including FBI! 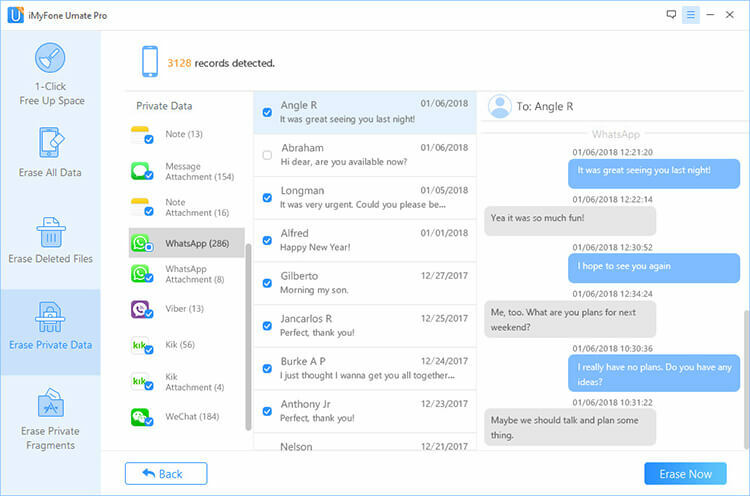 Permanently delete WhatsApp messages, photos, videos and other attachments and make deleted data unrecoverable. All the incomplete traces left by WhatsApp, LINE, Snapchat, Facebook, etc. will be fully effaced. Scan and fully destroy the WhatsApp messages which were simply deleted before. Free trial to clear all WhatsApp cache and junk at once. iMyFone WhatsApp Eraser has been highly rated and recommended by top tech review sites, like getintopc.com, MacWorld, etc. Step 1: Download and install iMyFone WhatsApp Eraser to your computer, then plug your iPhone into using your USB cable. Note: You can also select "Erase Deleted Files" or "Erase Private Fragments". Step 4: Choose your security level and type “delete” into the text box. And then click Erase Now. After that, your private data will be permanently erased and being no longer unrecoverable. Why We Need Cleaner for WhatsApp? As a communicating app, WhatsApp is easy to eat up a huge amount of space if you daily use it to chat with other. 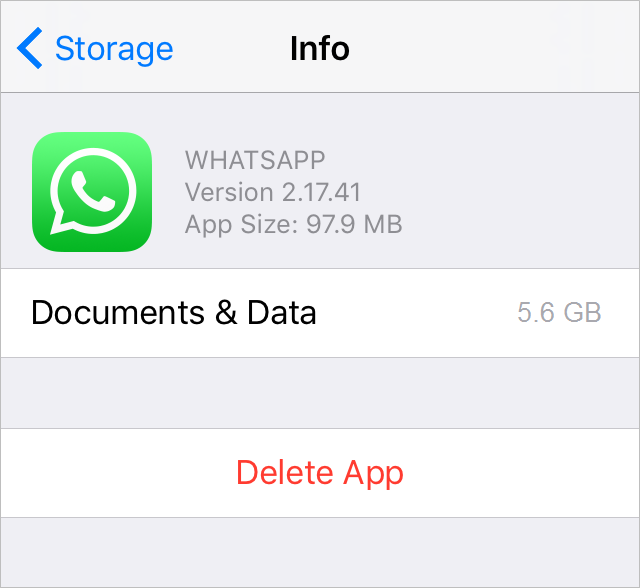 WhatsApp itself may occupy 97.9 MB while its documents and data may eat up as large as 5.6 GB space. WhatsApp itself does not provide built-in cleaning of WhatsApp cache, cookies, junk, temporarily downloaded files, and other hidden files. When deleting WhatsApp messages or any other files, you need to select one by one if you want to remove in batch. Or you should clear all the chat history all at once. WhatsApp files that you deleted by hand are still recoverable, which means your personal or private data can be hacked or stolen. There is no way to clear WhatsApp documents and data except uninstalling it. So if you need magic cleaner for WhatsApp, why not give a free trial of iMyFone WhatsApp Eraser? It should provides more than what you expect.